Have I mentioned how much I love my Instant Pot? Yes it’s a 7-in-1 device, so I appreciate the versatility of the appliance. 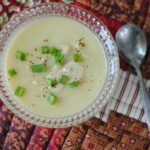 But I also love the ability to whip up quick and easy meals, such as this pressure cooker cauliflower soup. Healthy Instant Pot recipes are the bomb, right?! Cauliflower seems to be getting a lot of good press these days, perhaps because it is is suitable for Paleo, AIP and Whole 30 diets. But the reality is that the vegetable, which is a cruciferous vegetable (or Brassicaceae family, along with broccoli, cabbage, kale, Brussels sprouts and more), is an anti-inflammatory vegetable providing lots of nutritional value. Cauliflower is low-calorie (29 calories/cup) and high in fiber (11% of your daily value). It also provides a good amount of vitamins C, A and K and also Folate and Potassium. The high fiber content tends to fill you up, which in turn staves off cravings and hunger and also may help you eat less. These days cauliflower is being grated and used as rice, it’s being roasted, grilled, and sometimes even debuts as a pizza crust. Who knew?! And now for the recipe … this is a “soup-er” (lol) easy recipe. Seriously – a little washing and chopping and then turning on the Instant Pot and you will be golden. I’ll add variations below, but I also want to note that I love adding some raw cashew butter on top of this pressure cooker cauliflower soup. It adds depth and additional creaminess; I’m sure you could also add some toasted nuts to punch up the protein. Oh, and let me also add that all four of my kids ate this. Happy day! A recipe for quick and easy soup made in a pressure cooker. Full of vegetables and flavor! Turn on the Saute button on the Instant Pot. Add coconut oil and when hot, add onions and garlic. Saute for 2-3 minutes. Add cauliflower and saute for 1 minute. Press the "cancel" button on the Instant Pot and add the broth and water. Secure the lid, and press the Soup button; adjust time to 12 minutes. Let pressure release before removing lid. Blend with an immersion blender or in a blender (be careful if it is hot!). Add salt and pepper to taste. Add raw cashew butter if desired. Please let me know if you try this out in the comments below. 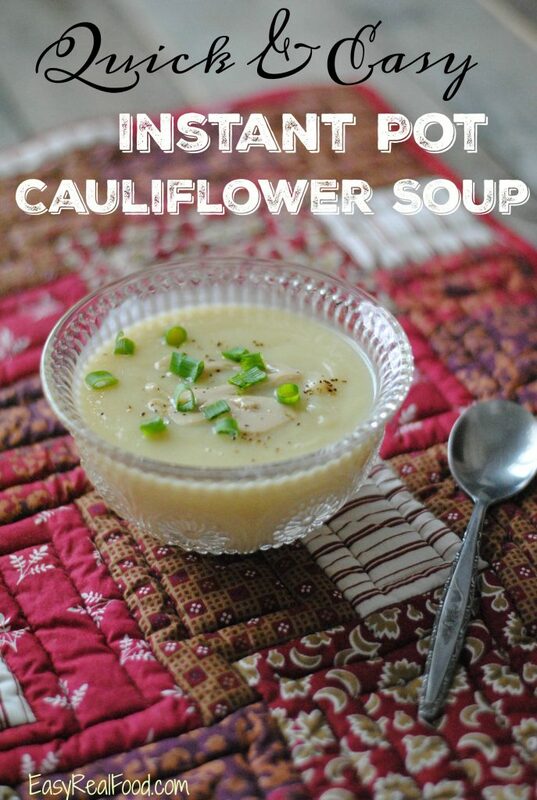 And if you haven’t gotten your Instant Pot yet, click here to check them out! I love, love, love mine and know that you will, too. Posts may contain affiliate links. If you purchase a product through an affiliate link, your costs will be the same but Easy Real Food will receive a small commission. This helps cover some of the costs for this site. We appreciate your support! This soup is so easy to make and so good! How many calories are in each serving? how many servings does it make? Apologizes! I updated the post with the servings (4 for the recipe). I don’t generally count calories but you can do a search and find calculators to do a nutritional breakdown if you’d like. 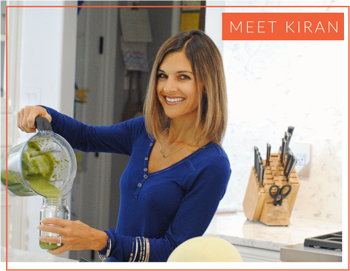 While I haven’t tried it, this may be an option: https://www.verywellfit.com/recipe-nutrition-analyzer-4157076. Using your recipe as the basis, I only had one head of cauliflower but also added a container of Trader Joe’s prepared mirepoix and several teaspoons of a veggie bouillon with water instead of broth. The cooking instructions are perfect! It was delicious with nutritional yeast on top. That’s fantastic! Love how you added mirepoix and also need to try it with nutritional yeast. Glad you enjoyed it!